Checklist: How To Move Your Horse To A New Home? Home » Horse Blog » Portugal » Checklist: How To Move Your Horse To A New Home? 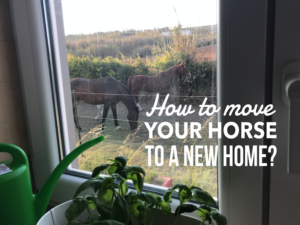 Moving home will cause both you and your horse to leave the comfort zone, so for sure it will be ‘stretchful’, but it doesn’t have to be stressful. 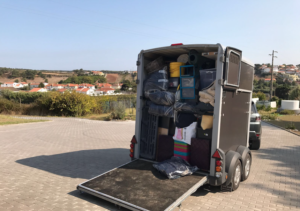 It just requires planning and here are a few things I learned from my experience in moving from the Netherlands to Portugal. 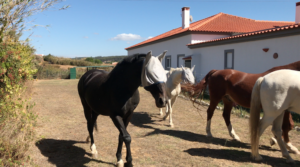 So let’s wrap up the ‘Moving to Portugal’ series with the checklist with 3️⃣8️⃣ items on how to move a horse to a new home. 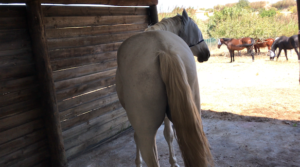 And I hope that – for those who will move their horses in the (near) future – it will help you and your horse to have your transition as close to comfortable as possible. ✅ Check your horse’s passport meets the requirements for traveling, especially if you move to another country. This is very important, because the day before we left (! ), we found out that two of the five passports allowed two horses to only travel from one country to another country, while the other three could travel unlimited through Europe. So we had to submit an urgent request for two new passports, and happily, that worked out fine. ✅ Schedule trimming, worming and/or dental treatment. Find out if there are any region-specific vaccines that your horse may now need. It’s important to do treatments before the transfer, to avoid unnecessary stress in the new environment. But do them no later than two to four weeks before departure, in case the veterinarian is not able to come in the last week before you leave, or you have to travel with a horse which is sore on his feet, because the farrier trimmed the hooves too short, or in case another treatment ended up in some complications. So, do things in time, to avoid unnecessary stress. ✅ Order hard (concentrated) food to transport to the new home. To reduce the risk of colic at the new home, it’s important to keep the feed management of your horse as close to the one at their previous home. So we brought many bags with concentrated food – that we used in the Netherlands – to Portugal. This way we can make any changes gradually, by removing a small amount of the ‘old’ hard food and adding in a small amount of the ‘new’. ✅ Organize transport in case you don’t own a truck or trailer to move your own horse. And make sure to make the traveling and transport as comfortable as possible. 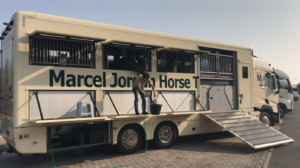 So we traveled with Marcel Jordan Horse Transport, and we hired a moving company to take our own stuff, so that we could travel with the horse truck. ✅ In case you use an international transport company, check if they organize the veterinarian check the day before transport – which is required when it’s international transport – or if you have to organize it yourself. ✅ Communicate with your horses about the upcoming move so they start to resonate on the upcoming changes. Just use your inner picture and inner feeling and the horses will know. ✅ Train the loading process. Never assume that a horse who has never been on a trailer or truck will load automatically. It’s a process of habituation, and this process needs time. Sotake the time it takes to train your horse to get on the trailer or truck, to avoid unnecessary stress on the day of transportation. ✅ If possible, visit your horse’s new living quarters: Can you park easily with the horse truck or trailer? Can you unload him in a stress-free environment? Where will he live? Inside, outside? Are the fences safe? What about food and water? If you arrive at a yard where automatic water dispensers are installed, then your horse might not drink if he’s not used to it. Check out other animals. Note other horses, barking dogs, or other creatures, and consider how they may affect your horse and daily routine. ✅ Find a veterinarian and farrier close to the new home. And if you move to another country, ask for recommendations (you can also do that in special country groups on Facebook) so you know who to call in case of an emergency. ✅ Arrange ‘First Aid’ kits for human and horses. ✅ Arrange boxes or travel kits for the second phase: the packing. ✅ Now it’s time for putting everything you own in boxes and kits. ✅ Make sure to not pack your (travel) halter and rope and keep an extra halter and rope ready, in case the usual one gets broken. ✅ A few days before a long-distance travel, do not exercise your horse intensively, and gradually reduce the amount of concentrated food to reduce the risk of tying-up. ✅ In case you travel internationally, you’ll have an appointment with a veterinarian. At a certain time and date, have your horse in a stable and have the passport and other related documents ready for the check. ✅ Maintain your calm. 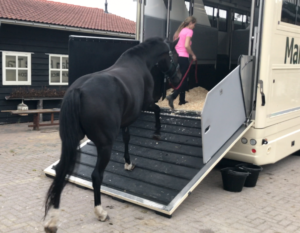 If you are traveling with a transporter, loading may be a little bit ‘stretchy’ for your horse when he’s not familiar with the trailer or truck. Now you will never have to tell your horse that you are sad, happy, confident, angry, relaxed or stressed. He already knows — long before you do! And horses are very good at mirroring…So your horse might enter the stress zone if YOU are feeling stressed about it! So keep calm and be the example you want to see. ✅ To avoid leg issues, don’t use shipping bandages. Especially during long-distance transport – when a horse has to travel up to 9-11 hours – they are not healthy for the tendons. Because bandages don’t allow the heat to escape, so they can easily overheat the legs, with temperatures of up to 40°C / 104°F. ✅ Slant or straight loading. Research has shown horses will naturally take a diagonal position on the road when given a choice. ✅ Tied or not tied. In general, a horse will find traveling less stressful when he can move his head freely. It also reduces the risk of shipping fever. ✅ Space, light and fresh air. Ventilation and enough space between horses is a must. ✅ Fresh hay. To avoid an empty and acidified stomach during a long distance travel, supply unlimited hay. 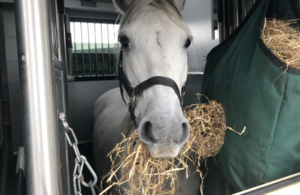 And to avoid tying-up after a long distance travel, make sure to only feed hay during the traveling period that is high in fructan, low in protein, and with high energy value. ✅ Fresh water. Supply 30-40 liters of water during 24h, because dehydration might cause colic and other issues. ✅ Appropriate bedding. Insufficient bedding will cause a mess, plus a horse that has plenty of wood shavings is less likely to have trouble urinating. ✅ Maintain your calm. Again, it might be YOU, causing your horse to enter the stress zone. If YOU are feeling stressed about unloading your horse you might transfer that to your horse. So keep calm and be the example you want to see. ✅ Reduce the risk of dehydration. A risk for colic when horses change home is decreased water intake. So we made sure we provided a large and clean trough with fresh water. And if you arrive at a yard where automatic water dispensers are installed, then your horse might not drink if he’s not used to it. So make sure to show him the way to the water and keep an eye on him. ✅ Reduce the risk of infectious disease. When we arrived, there were a couple of horses in the neighboring meadow, but we made sure they could not touch or sniff each other, to reduce the risk of horses passing infectious diseases to one another. And in case you travel to a yard with other horses, try to keep your horses separate from other horses for at least a week. Also, keep your horse’s feed and water buckets separate from those of other horses in the yard. ✅ Check your horse’s gum. 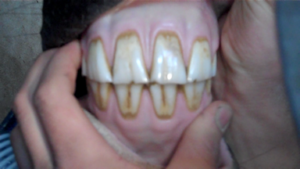 Your horse’s normal gum color is a healthy pink – not too dark, not too light. When dehydration sets in, the gum often turns to a very pale pink or even white. ✅ Check your horse’s temperature. At rest, it’s usually between 37.5°C – 38.0°C/ 99-101°F. An elevated temperature, especially if combined with a cough, may indicate ‘shipping fever‘. ✅ Check your horse’s behavior. 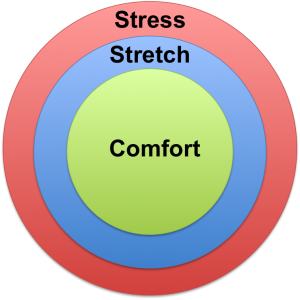 Of course, he might show changes in behavior because everything is new, so he will be out of his comfort zone and in the stretch zone. But changes in behavior combined with reduced feed and water intake, or with high temperature or a cough, can be signs of illness and an indication to call a vet. ✅ After our 4-day journey from the Netherlands to Portugal – with unlimited fresh hay but without hard food – we gradually introduced our own forage over the week. Because an instant change in forage and routine can be a big risk of colic. Plus, remember to reduce hard feed if your horse is not being worked as hard as usual during the first week(s) at the new home. When returning to your normal daily routine, keep the feed management of your horses as close to the one at their previous home, but if you moved to another country, adjust it to the new climate if needed. ✅ The pastures in Portugal are quite dry at the moment, but in case you arrive at a yard with juicy, green pastures, start by turning out for a couple of hours a day and gradually increase over a few weeks, to reduce the risk for laminitis. ✅ Establish a new routine quickly. It’s likely some things will change in the new home, but try to stay as close as possible to your previous routine. ✅ The most important thing of all in the first week is to master your energy and to be the example you want to see in your horses. The more you can find your balance at the new home, the sooner your horses will be in balance. ✅ Give your horse time to settle. At the new home, give your horse time to settle at his own pace. So take care not to set high goals for your horse, or to act immediately as a ‘human doing‘ . Instead, remain a ‘human being‘ for a while and take time to ‘just be‘ with your horses. So just spend time by just hanging out together, doing nothing. The need for certainty and safety, because the horse is a prey animal with a flight instinct. So we provide safe and stress-free surroundings. The need for connection with other horses, because horses are herd animals. 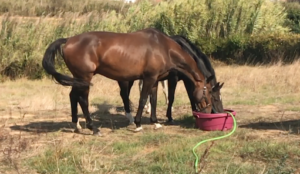 Already in the Netherlands, my horses were living together, so we didn’t change that here in Portugal. The need for water and eating small amounts throughout the day, because horses are herbivores. So we provide sufficient fresh water and roughage throughout 24h. The need for movement, because horses are steppe animals and not ‘designed’ to live 23 hours in a stable. 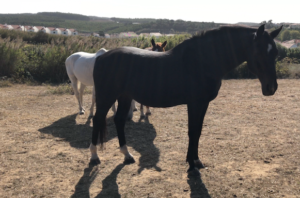 Already in the Netherlands, my horses were living 24/7 outside in the pasture, so we didn’t change that here in Portugal. The need for variety, because living 100% in the comfort zone will be boring and unnatural. So we have our horses commute between four different areas throughout 24h. 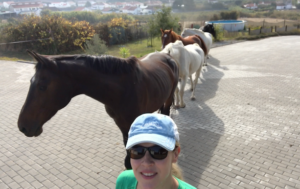 And by meeting those needs, our horses settled down very quickly and easily in Portugal. Thank you for this great checklist, Marijke ! Thanks you for the checklist Marijke, very very timely for me as I am moving house with my 2 horses this coming weekend. I also have a new yearling filly coming to join in the week after and now I am a little worried that it will be too soon…but I will do as you advise and let them relax into their new environs…just chill with them. I hope the filly introduction will go ok..she is very sweet and my boys are gentlemen fingers crossed it will work out ok. I will do my best to make it safe and stress free. I love love love how you are moving your horses around and giving them variety from field to field all in a happy herd, bamboo!..they are sooo chilled and happy and so are you 🙂 but you are always happy! I have very very similar plans for my place …I will try to create my own wee blog and share it with the ST community as I think it is fantastic to show this more horse friendly way of keeping horses to others and to share the ideas. That sounds great Sarah! Good luck with everything! Excellent Step by Step on Long distance transporting of our beloved equine. This would also work for us in transporting between states here in the U.S.